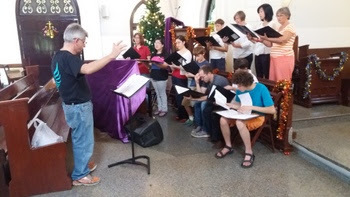 Our Wonderful Nine Lessons and Carols! 11 am Combined Eucharist – No 9:15 am service this week! 11 am Christmas Family Eucharist followed by pot-luck lunch! 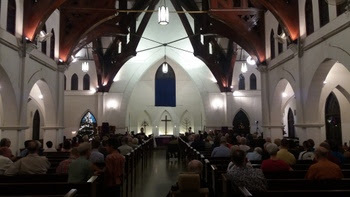 Our Festival of Nine Lessons and Carols was more successful than we could have imagined with over two hundred people in attendance. Video of the event can be seen via this link! Thanks again to all who made it such a wonderful event! On Christmas Day we will be sharing a special pot-luck lunch following the morning service. All are welcome to attend, but if you know that you will be there let me know, so we can organise things a little! Six people haveconfirmed so far! For this Fourth Sunday in Advent, our readings are Isaiah 52:7-10, Romans 16:25-27, and Luke 2:1-20. These are different from the set readings for this week as some people will be unable to attend on Christmas Eve or Christmas Day. We will be singing the hymns O Come All Ye Faithful, Let all Mortal Flesh keep Silent, O Little Town of Bethlehem, and Joy to the World! Our sermon will be entitled Shepherds Pie, again? 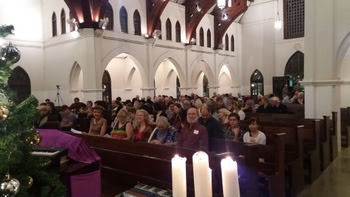 A big thank you to all who made last night’s Festival of Nine Lessons and Carols such a great success. 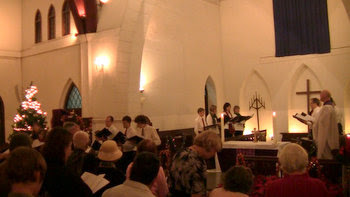 We had over two hundred people gathered in the Chapel of the Prince Royal’s College to celebrate the coming of Christ through words and music. Thank you especially to Harvey Nicholson who directed the choir and brass band, and to all the singers and musicians. You were all amazing! And thanks to all who worked behind the scenes, setting up, tidying away, and providing refreshments. It was worth all the effort and we also raised over THB10,000 for The McKean Rehabilitation Center! Thank you so much. Click here to watch the Video! Saturday, 7pm in the Prince Royal’s College Chapel! Our Festival of Nine Lessons and Carols is only two days away! As you know, the service will begin at 7pm and is being held in The Prince Royal’s College Chapel. We really have no idea how many people will come but we expect between one hundred and two hundred to attend – we have printed 150 programs! The schedule for those involved is below. Non-singers are very welcome to come and help set up, and nobody needs to be there the whole day, unless they want to! 1:00 Arrive at PRC Chapel to set up. Tickets are being sold for THB100 in aid of the McKean Rehabilitation Center and will be available on the door. The service will be followed by refreshments at the Chapel. Caitlin, who is coordinating this, requests that everyone bring cookies, desserts, etc, to share afterwards. We again plan to share a Christmas lunch together on Christmas Day. However, as nobody has yet signed up for the Christmas Lunch, we may instead make alternative arrangements so that nobody need be alone this Christmas Day. Last Chance! Please sign up this week if you would like to come! There will be no service on Sunday 27th December as it is only two days after our Christmas services. Worship will resume on 3rd January. For this Third Sunday in Advent, our readings are Zephaniah 3:14-20, Philippians 4:4-7, and Luke 1:26-38, and we will be singing the hymns Once in Royal David’s City, The Angel Gabriel from Heaven Came, It Came Upon a Midnight Clear, and Angels from the Realms of Glory. Our sermon will be entitled Mary, did you know? Video and audio of our major services can be found on the Audio-Visual page of the All Saints website and as always, directions can be found on the Where and When page. 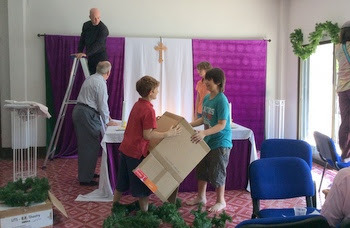 Only just over a week to our Festival of Nine Lessons and Carols, and last Sunday we had great fun as we shared lunch together and decorated the church for Advent and Christmas. Advent is indeed a time of preparation, both practically and spiritually, as we shall see in this week’s sermon. Our Festival of Nine Lessons and Carols is now just over a week away. 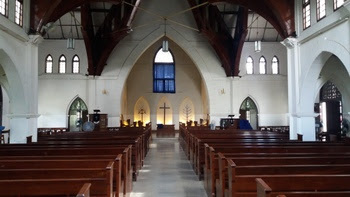 As you know, the service will begin at 7pm and is being held in The Prince Royal’s College Chapel. 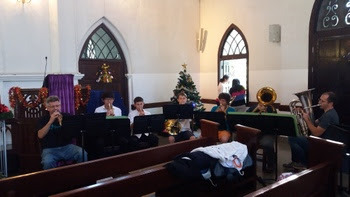 Tickets are being sold for THB100 in aid of the McKean Rehabilitation Center and are now available for sale at the church, from Bake and Bite, and from the Front Office atChiang Mai International School. Please take some to sell to your friends. Those who can help with setting up the tree, tables, organ, etc, should also come at 2:30. Posters advertising both the Nine Lessons and Carols, and our other Christmas events are also still available for distribution. 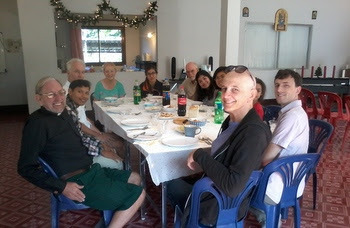 We again plan to share a Christmas lunch together on Christmas Day. Please sign up this week if you would like to come! Also, coming up this Wednesday, 9th December, at 7:30pm there will be a performance of Handel’s Messiah at Payap University. It will be in the Leviticus Auditorium (on the MaeKhao Campus – in the Law Building east of the Ring Road 1) Admission is free, but donations are appreciated. Let me know if you would like to go. For this Second Sunday in Advent, our readings are Baruch 5:1-9, Philippians 1:3-11, and Luke 3:1-6, and we will be singing the hymns O Come O Come Emmanuel, Christ whose glory fills the skies, Lo He comes with clouds descending, and Come Thou long-expected Jesus! You can find the readings via this link. Our sermon will be entitled Are you ready?